Just like last week, the Rangers (6-2-2) bounced back from a difficult overtime loss with a gutsy 4-1 home win over the Calgary Flames (2-6-0), who continue to struggle at the start of the season. It’s crazy how quickly a game can change, and that was the case in this one. 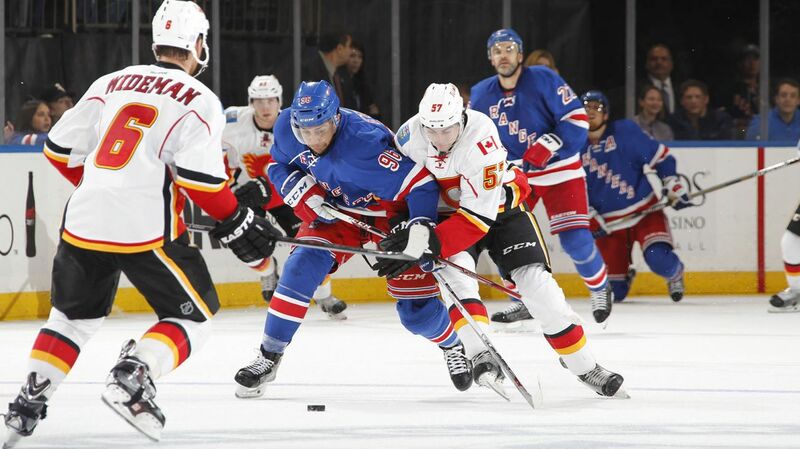 The Flames were up 1-0 through the first half of the game, and the Rangers were finding chances hard to come by. But two goals in less than five minutes changed the course of the game. Antti Raanta, making his second start as a Ranger, was scored on by the first shot he faced, but he settled in nicely after that, stopping the next 22 shots that he saw. Raanta is unbeaten in regulation when playing at home, posting a 16-0-3 career record, including a 2-0-0 record at MSG. Emerson Etem also played in his first game, slotting into the injured Viktor Stalberg’s spot on the fourth line with Dominic Moore and Jarret Stoll. In the first period, The Rangers looked like a team that had played the night before, playing sloppy in all three zones and failing to convert on chances. There wasn’t a lack of chances for the Rangers, but they missed the net on numerous occasions. The first blown opportunity came on the power play, which Derek Stepan drew just 36 seconds into the game. 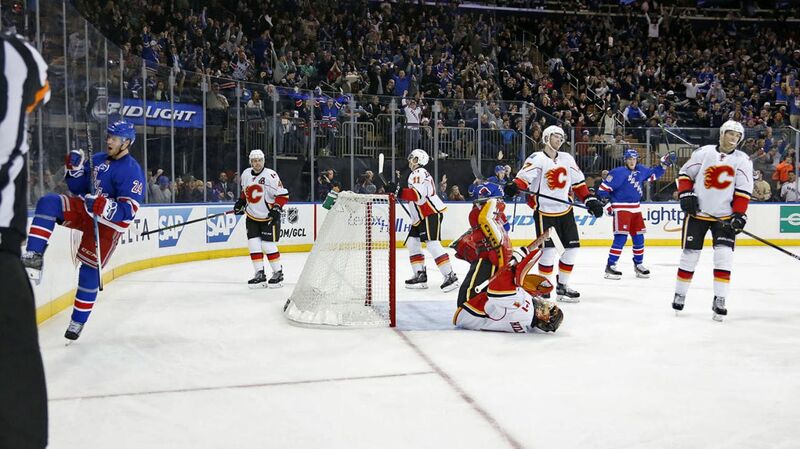 Kevin Hayes was on the receiving end of a gorgeous pass from Derick Brassard, and Hiller was caught out of position. Hayes had the whole net to shoot at, but missed the far post by mere inches. Shortly after that, the Flames would find the back of the net. Marc Staal had yet another costly turnover in his own zone, handing the puck over the Sean Monahan, who passed it to Johnny Gaudreau. He sent a backhand pass over to Jiri Hudler, and Hudler tapped it in past Raanta for his third goal of the season. Emerson Etem, playing on the fourth line, had a great chance of his own. Jarret Stoll centered a puck, and Etem found himself in front of the net, outmuscling Mark Giordano to get into position. Etem got a stick on it, but redirected it wide. Emerson Etem played in his second game this season, notching an assist. Photo courtesy of MSG Photos. The Rangers would get another power play opportunity late, but failed to get a shot on goal again. To contrast, the Flames had three shots on goal, including two on a breakaway. Mikael Backlund was denied on the breakaway, and Raanta quickly shifted to his left to deny Frolik on the rebound. Jonas Hiller did not look sharp, getting caught way out of position on Hayes’ missed chance, and looking shaky making stops against Dominic Moore and a few others. If they had hit the net more, New York could have found themselves up a goal. The second period started out very similar to the first, with the Rangers struggling to generate much in the early stages. The Blueshirts continued to miss the net, recording just five shots on goal to the Flames 10. Late in the period, the Rangers would finally break through, and it was the rookie Oscar Lindberg getting back on the board with his team leading fifth goal of the season. Marc Staal passed the puck to Kevin Hayes, who carried it behind the net. While looking for a play, he wound up making a spinning backhanded pass to Oscar Lindberg, who redirected the puck off of Dougie Hamilton and through the legs of Jonas Hiller. A few minutes after that, the Rangers found the back of the net yet again, and it was Dan Girardi scoring his first goal of the season. Emerson Etem worked the puck over to Girardi in front of the net, and his wrist shot went off of Hiller’s stick and into the net. Jarret Stoll had the secondary assist. Dan Girardi celebrates his 200th career NHL point. Photo courtesy of MSG Photos. The assist was Emerson Etem’s first point as a Ranger, while Dan Girardi’s goal gave him 200 points, all as a member of the Ranger. The goal came on the night where he surpassed Mark Messier for games played as a Ranger. The start to the third period was very slow, with minimal chances on both sides. Antti Raanta made a nice play to poke the puck away from Sam Bennet as he danced around Dan Girardi and cut to the front of the net. After a bunch of nothing, the Rangers broke through with a huge third goal, as Kevin Klein found the back of the net for his second goal of the season. Emerson Etem was stopped right in front of the net by a lunging Jonas Hiller, stretching out the left pad to prevent his first goal of the season. In the midst of all of the confusion following a scramble for the puck, Klein collected it and banked it off a Calgary defender to extend the Rangers lead to 3-1. 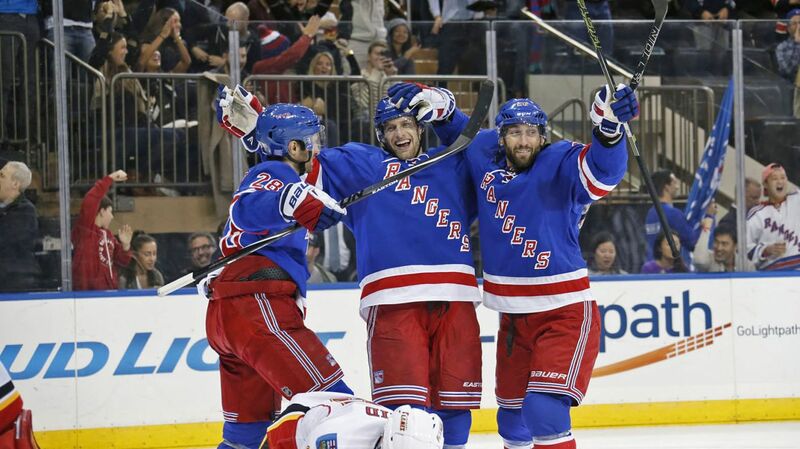 Less than two minutes later, the Rangers scored another goal, continuing their offense in short bursts. After the puck hit Ryan McDonagh in the chin area, Jesper Fast picked the puck up and brought it into the offensive zone. He handed off to Derick Brassard, and he rifled a shot past a Chris Kreider screen and past Hiller, his third goal of the season. So far this season, Rick Nash’s first goal came on a play where the puck didn’t go into the net, and Ryan McDonagh’s first point occurred when he was smacked in the face with a puck. I bet that doesn’t happen too often. Jonas Hiller was then replaced by Jonas Ortio for the last 7:59. Hiller allowed four goals on 21 shots, seeing his GAA balloon to 3.52 and his save percentage fall to .872. It wasn’t a pretty win by any means, but a win is a win, and coming away victorious in these grind-it-out kind of games shows the true character of the team. Even though the Rangers have started out slow in some aspects of their game, it’s encouraging to see that they’re still able to grind out wins. For the second game running, the third line consisting of Miller-Hayes-Lindberg was the best on the team. They got a good amount of ice time, and opened the scoring for the team and got them out of their slow start. Oscar Lindberg has five goals and two assists through 10 games to start his rookie season, and he’s scored just one goal less than the entire Anaheim Ducks team. He never makes mistakes, he’s always in the right position, and he’s defensively responsible as well. Lindberg leads the Rangers in goal scoring and in points. Oscar Lindberg celebrates after scoring his team leading fifth goal of the season. Photo courtesy of MSG Photos. Emerson Etem replaced the injured Viktor Stalberg in the lineup, and he played pretty well in his 11:56 of ice time. Etem picked up his first point as a Ranger, and came extremely close to scoring a goal. He was much more noticeable during the game too. If Stalberg is out for the next game, on Friday, then I’d like to see Etem off of the fourth line and into a scoring role. Antti Raanta came up big yet again, stepping in and giving Henrik Lundqvist the night off but still coming away with a win. Raanta stopped 22 of the 23 shots that he faced, and 44 of the 45 shots that he’s seen through two games. He’s been excellent in relief of Lundqvist, and Vigneault now knows that he can be trusted. The Rangers have a long break, playing their next game on Friday at Madison Square Garden against the Toronto Maple Leafs. Posted on October 26, 2015, in Game Recaps and tagged Alain Vigneault, Calgary Flames, Chris Kreider, Dan Boyle, Dan Girardi, Derek Stepan, Derick Brassard, Dominic Moore, Duclair trade, Dylan McIlrath, Emerson Etem, Jarret Stoll, Jesper Fast, Johnny Gaudreau, JT Miller, Keith Yandle, Kevin Hayes, Kevin Klein, Madison Square Garden, Marc Staal, Mark Giordano, Mats Zuccarello, MSG, New York Rangers, New York Rangers blog, NHL, NYR, Oscar Lindberg, Rangers, Rangers blog, Rick Nash, Ryan McDonagh, Viktor Stalberg. Bookmark the permalink. Leave a comment.